According to the National Retailer Federation nearly 165 million people expected to be shopping during the Black Friday-through-Cyber Monday period this year. It’s also a prime time for hackers and cyber-thieves looking to steal personal information. We have gathered some helpful information on getting the deals you want and protecting your personal information. Consumer Reports has been tracking Cyber Monday deals for years, and knows all the tricks. Their Cyber Monday shopping tips will help you get the best deal on the items you want and keep frustration—and overspending—to a minimum. Do your homework. Getting the best deals on Cyber Monday can take some work because online retailers can update specials, or take away or add new deals, at almost any time during the event. The good news is that most of the Black Friday sites —BFAfads, BestBlackFriday.com, DealNews, TheBlackFriday.com, and GottaDeal.com—also track Cyber Monday deals. Sign up and these sites will send you deal alerts, which you can typically filter by product category. Sign up for loyalty programs. Stores often have loyalty programs that offer sales and promotions to their members first, then let them earn rewards on what they buy. Signing up for Cyber Monday shopping alerts will get you the early word on promotions, coupons, and discounts. In some cases, you can even find out whether the products you want are in stock or eligible to buy online and pick up at the store, which can save you on shipping. Create a budget—and stick to it. Yes, this sounds simple. But Cyber Monday sales, especially the special deals available in limited quantities, are designed to get you on the retailer’s website, so hopefully they can sell you additional items. Check return and exchange policies in advance. It’s always good to know a store’s price-match and return policies. Read the fine print. Check the return and exchange policies for Cyber Monday sales to make sure that the store won’t charge a restocking fee for any item you return. See whether you’ll have to pay shipping for purchases or returns. More retailers are offering free shipping on Cyber Monday, even if they don’t at other times of year. But make sure before you buy. And if you’re buying from the website of a retailer with walk-in stores, see whether you can return items to a store to avoid any shipping costs. Stay safe from hackers. Avoid using an unsecured public computer, or public WiFi, when shopping because you’ll be probably be entering credit card information. If you’re using a retailer or shopping app, make sure it comes from one of the major app stores, such as the Apple App Store or Google Play. And follow these additional tips to make sure it’s not a fake app created by scammers. Look for the Lock. Never ever, ever buy anything online using your credit card from a site that doesn't have SSL (secure sockets layer) encryption installed—at the very least. You'll know if the site has SSL because the URL for the site will start with HTTPS—instead of just HTTP. An icon of a locked padlock will appear, typically to the left of the URL in the address bar or the status bar down below; it depends on your browser. HTTPS is pretty standard now even on non-shopping sites, enough that Google Chrome flags any page without the extra S as "not secure." So, a site without it should stand out even more. Don't Overshare. No online shopping e-tailer needs your Social Security number or your birthday to do business. However, if crooks get them and your credit card number, they can do a lot of damage. The more scammers know, the easier it is to steal your identity. When possible, default to giving up as little personal data as possible. Buy online only with a credit card. Speaking of, you should definitely only buy online with a credit card. If your debit card is compromised, scammers have direct access to your bank funds. Any seller that wants a different kind of payment, like wired money, is a big red flag. Check Statements Regularly. Don't wait for your bill to come at the end of the month. Go online regularly during the holiday season and look at electronic statements for your credit card, debit card, and checking accounts. Create Strong Passwords. PCMag readers were asked in a survey if they frequently changed their passwords. Eleven percent claimed they did it every day. The vast majority only change a password to protect privacy a few times a year (27 percent) or more likely, never (35 percent). Password Manager. The smarter move: use a password manager to create uncrackable passwords for you. It'll also keep track of them and enter them, so you don't have to think about it. About 24 percent of people in a PCMag survey said they use a password manager, but the number should be higher. Skip the Card, use the phone. Paying for items using your smartphone is pretty standard these days in brick-and-mortar stores and is actually even more secure than using your credit card. Using a mobile payment app like Apple Pay generates a one-use authentication code for the purchase that no one else could ever steal and use. Plus, you're avoiding card skimmers - and you don't even need to take your credit card with you if you only go places that accept phone payments. How does that matter if you're online shopping? Many an app will now accept payment using Apple Pay and Google Pay. Don't be embarrassed if you get taken for a ride while online shopping. Instead, get very, very mad. Complain to the seller. If you don't get satisfaction, report it to the Federal Trade Commission, your state's attorney general, even the FBI. 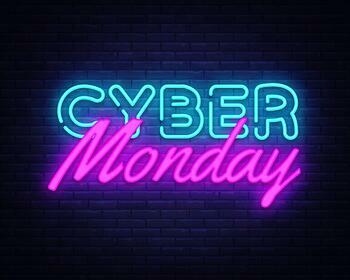 We wish you a safe and exciting shopping experience on Cyber Monday. When you have questions about your insurance, we are always here to give you straight answers.